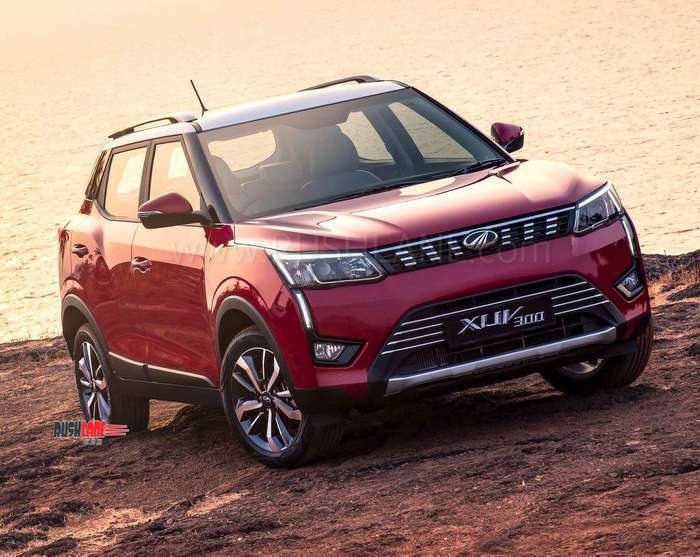 Will Mahindra XUV300 manage to top the compact SUV segment? A number of carmakers are eying the fast growing compact SUV segment and the latest entrant is Mahindra XUV300, which will be launched on February 14. Launch on Valentine’s Day may just be a coincidence or there may be expectations that St. Valentine would somehow influence customers to fall in love with XUV300. 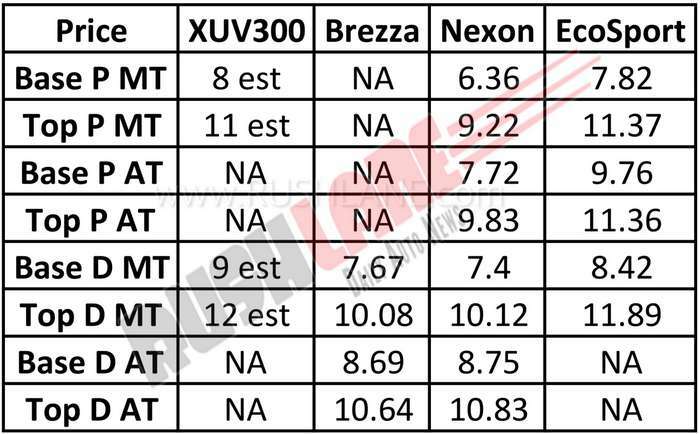 Launch date certainly has positive vibes, but can XUV300 effectively compete with rivals such as Tata Nexon, Maruti Brezza and Ford EcoSport? Let’s try to answer that with a quick comparison between Mahindra XUV300 vs Tata Nexon vs Maruti Brezza vs Ford EcoSport. Design and styling: Good looks matter in this segment, as customers want their compact SUVs to be noticeable on the streets. All four SUVs are designed to be head turners and have their own unique style characteristics. For example, XUV300 draws inspiration from the muscular, yet lean body of a cheetah. This is evident in its vertically placed LED DRLs, uniquely shaped fog lamp housing, prominent wheel arches, and athletic side profile. Tata Nexon looks sophisticated with its coupe inspired aerodynamic design and comes with chrome accents and unique feline-eye shaped DRLs. Maruti Brezza looks sporty and glamorous and has masculine exteriors that make a dominating stance on the road. Ford EcoSport has the right curves at the right places, which is a pleasure to look at. 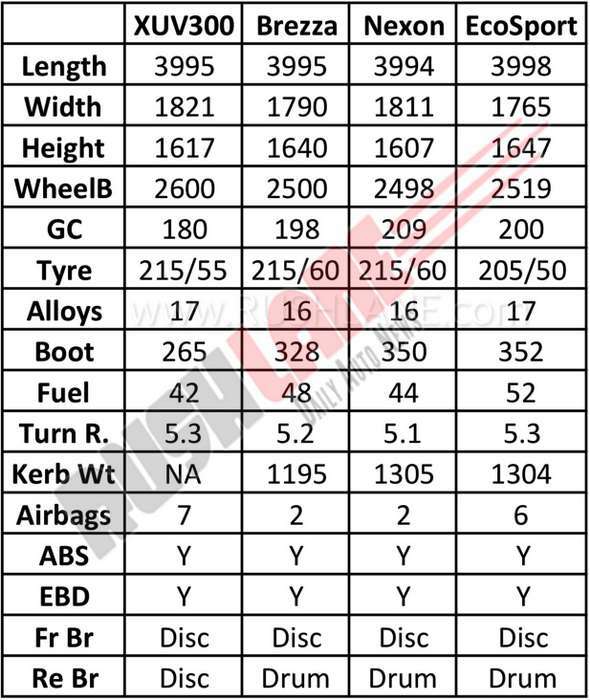 Below is a detailed look at the four SUV’s on the basis of dimenstions, kerb weight, fuel tank, tyres, brakes, turning radius, etc. Interiors: Mahindra XUV300 has dual-tone colour theme with light coloured upholstery that makes interiors look more spacious. Central console has 7-inch touchscreen infotainment system that supports Apple CarPlay and Android Auto. The screen also works as the display for rear-parking camera. A key differentiator for XUV300 is its sunroof, which is missing in Nexon and Brezza. Tata Nexon has three-tone dashboard and comes with one-of-its-kind 6.5-inch floating touchscreen on the dash top. Maruti Brezza has SmartPlay infotainment system and cockpit style instrument cluster with mood lights. It has fabric seat upholstery and chrome accents at various places. Ford EcoSport has sports orange interiors, which is designed for both style and comfort. It has a sunroof, which is being marketed as the funroof. Touchscreen infotainment system is proprietary SYNC3 8-inch unit that also doubles up as the display for rear-parking camera. Engine and transmission: Mahindra XUV300 will offer 1.2 litre petrol and 1.5 litre diesel option at the time of launch. Petrol engine delivers 110 hp @ 5000 rpm and 200 Nm @ 2000-3500 rpm. Diesel engine makes 115 hp @ 3750 rpm and 300 Nm @ 1500-2500 rpm. Both engines are mated to 6-speed manual transmission. 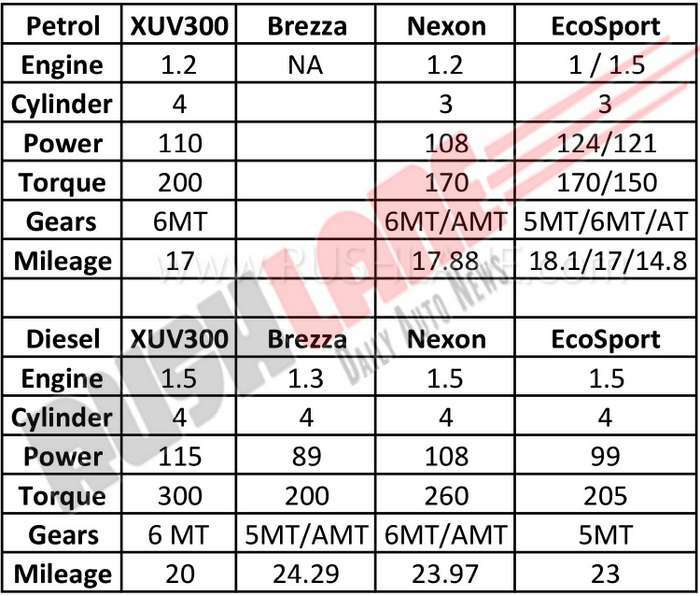 Nexon has similar capacity petrol engine, but its power output is less than XUV300. Brezza currently does not have a petrol variant. Ford EcoSport petrol delivers max power, as it has a larger 1.5 litre petrol engine. In the diesel category, XUV300 delivers more power than all three SUVs. The only thing XUV300 may be lacking is automatic transmission, which is offered by all three rivals. Safety & security: XUV300 leads in this category, as it comes with a wide range of high-end safety and security features. There’s 7 airbags, ABS with EBD, ESP with hill-hold assist, rear parking camera and sensors, front parking sensors, disc brakes on all four wheels, and ISOFIX anchorages. Standard security features such as dual airbags, cruise control, seat belt reminder, engine immobilizer, front fog lamps, speed sensing door lock, and rear wash wiper and defogger can be seen on all four SUVs. Comfort & convenience: All four SUVs are designed for superior comfort and convenience with various features such as power windows, tilt steering, electrically adjustable ORVM, central locking, rain sensing auto wipers, and steering mounted controls. A key differentiator for XUV300 is its dual-zone climate control, which is a segment-first feature. However, XUV300 does not have rear AC vents. Pricing: Mahindra XUV300 is expected to be priced in the range of Rs 8-12 lakh. However, the company can choose an aggressive pricing strategy at launch to attract customers. Starting price of all three rivals is below Rs 8 lakh. Verdict – Which one should you buy? : Mahindra XUV300 has the desired goodies, many of which are better than that of its rivals. It is based on SsangYong Tivoli’s X100 platform and is expected to get high safety ratings. It is at par with rivals in terms of looks and fares better in terms of engine power output. It offers high-end safety and security features and the best in comfort and convenience. If it is best in class comfort, features and performance you are looking, then the XUV300 is for you. If you are looking for a value for money proposition, then it is the Maruti Brezza for you. Pricing will decide how successful the XUV300 will be. Mahindra will reveal official prices on 14th Feb.